The Stencil palette allows you to use and control a stencil. A Stencil is a grayscale image which masks all painting and sculpting actions on the canvas. In a Stencil image, lighter areas indicate stronger masking — actions will be more limited in those areas. An area which is completely white blocks actions entirely. The Stencil palette stores the current stencil, and provides a variety of ways to manipulate it. When the Stencil is turned on, it can be transformed by pressing the spacebar and clicking on the canvas — a unique ‘coin controller’ appears, enabling you to move, stretch, or rotate the stencil. Unlike other palettes (which store a library of several items), the Stencil palette contains only one Stencil. However, Stencils can be created from any Alpha (which in turn can be imported or grabbed from the canvas). To create a stencil from the selected Alpha press the Make St button in the Alpha > Transfer menu. The Stencil On button activates/de-activates the current Stencil. A Stencil is a grayscale image which masks all painting and sculpting actions on the canvas. 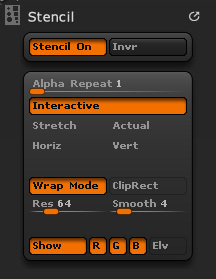 The current Stencil can be defined from any Alpha by pressing the ‘Make Stencil’ button in the Alpha palette. Change the Stencil’s position, size or orientation using the Coin Controller, which is accessed by holding the Spacebar on your keyboard. The Invert Stencil button reverses the current Stencil, so that dark areas become light (masked), and vice-versa. When set to a value n above 1, the original stencil is put into an n by n grid. You can use this to stencil any sort of repeated pattern. If the stencil was made from a seamless alpha (one that wraps left to right and top to bottom without visible seams), the resulting gridded stencil will produce a seamless effect. The Interactive Positioning button becomes pressed whenever you change the Stencil’s position, size or orientation using the Coin Controller. The Coin Controller is accessed, when the Stencil On button is pressed, by holding the Spacebar on your keyboard. The Actual Size button resizes the Stencil to its standard full size. It also centers the Stencil in the document window, and rotates it so it’s level and flat against the canvas. The Fit Horizontally button resizes the Stencil so its width fits inside the canvas width. The Stencil’s height is resized proportionally. The Stencil is also centered in the document window, and rotated so it’s level and flat against the canvas. The Fit Vertically button resizes the Stencil so its height fits inside the canvas height. The Stencil’s width is resized proportionally. The Stencil is also centered in the document window, and rotated so it’s level and flat against the canvas. The Fit Stretch button resizes the Stencil so its height and width match those of the canvas. The Stencil is also centered in the document window, and rotated so it’s level and flat against the canvas. The Wrap Mode button causes the stencil to wrap around the contours of items on the canvas. The accuracy of fit can be defined using the Wrap Resolution and Wrap Smoothness sliders, below. The Wrap Resolution slider, enabled only when Wrap Mode is pressed, determines how accurately the Stencil wraps onto contours of items on the canvas. Higher values result in more accurate wrapping, but slow response time when manipulating the Stencil. The Wrap Smoothness slider, enabled only when Wrap Mode is pressed, determines how rigidly the Stencil retains its shape when wrapping onto contours of items on the canvas. Smaller values result in a Stencil which wraps fluidly onto the contours; higher values result in a Stencil which is smoother in tight corners. The Show Stencil button shows/hides the Stencil. When hidden, the Stencil remains active. While manipulating it with the Coin Controller, the Stencil becomes visible, regardless of this button’s status. The Red, Green and Blue buttons in the Stencil palette determine which color components combine to create the Stencil’s displayed color. For example, to display the Stencil as yellow, press the Red and Green buttons, and un-press the Blue button. These buttons have no effect on whether the Stencil masks actions on image color channels. To specify whether painting and sculpting actions affect these channels, use buttons in the Draw:Channels sub-palette. The Elevation Mode button determines whether the Stencil is displayed as a grayscale image, or as elevation-map-style contour lines. In Elevation Mode, the Stencil is transparent, making it easier to see items behind it. The lines’ color is determined by the Red, Green and Blue buttons.